I knew a little about the charities but I had no idea of the scale of their operations. 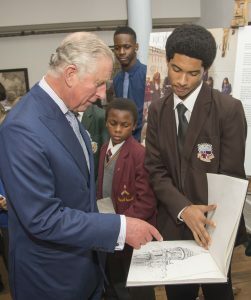 In Prince & Patron, Prince Charles has deliberately mixed old and new works of art together and the result is an exciting and energizing exhibition. 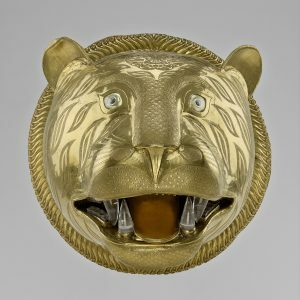 The summer exhibitions in the Buckingham Palace State Rooms are always interesting and well-thought out, and the curators are passionate as well as knowledgeable about them, but this year is something special. Everyone to whom I spoke was really excited about the Prince & Patron exhibition; even the staff in the palace gardens outside talked enthusiastically about it. There was that unmistakable buzz in the air. 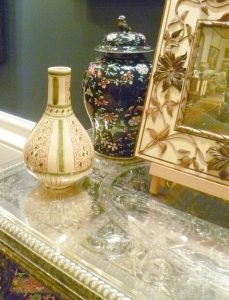 Prince & Patron is not your standard exhibition, with objects displayed separately across several of the state rooms; instead, The Prince has transformed the octagonal Ball Supper Room into an eclectic Aladdin’s cave of treasures. 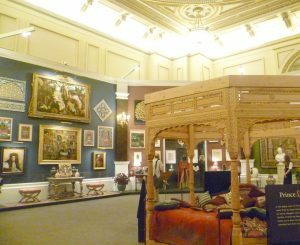 Each of the eight sides has a different ambience; a 17th century tapestry, for example, might have a cornucopia of objets d’art, furniture and pictures arranged with careful informality in front of it. Prince Charles has not hesitated to add family photos (including one of the new Duke and Duchess of Sussex emerging from St George’s Chapel hand in hand after their wedding), bowls of flowers, and various knick-knacks which are obviously special to him. 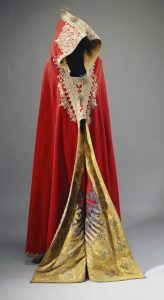 I loved the juxtaposition of Napoleon’s scarlet felt and silk cloak, found in his carriage after the battle of Waterloo; Jethro Buck’s modern tree paintings; and the gold and rock crystal tiger’s head from Tipu Sultan’s throne. 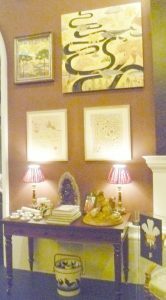 In the centre of the room is a cedar wood pavilion full of colourful handmade Welsh rugs and cushions. Unfortunately, you can’t go inside and loll – but the pavilion helps to give the space its informal atmosphere. 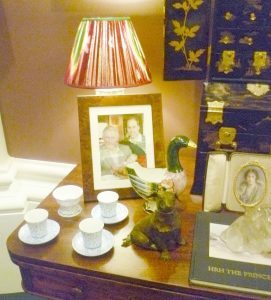 Various objects from different periods, including photos of Prince Charles and Prince William, and the Queen Mother, with a Japanese lacquer of wood bureau cabinet in the background. I was part of a group of several dozen journalists, reviewers and bloggers and it soon became obvious that some people were unsure how to react. 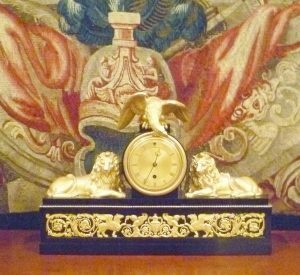 Prince Charles has arranged the objects he’s chosen with a certain chutzpah and taken little notice of traditional notions of display. The octagonal room is crowded, even over-crowded with an astonishing medley of stuff; 21st century china sits next to an 18th century Italian japaned and gilded bureau cabinet; Antonio Verrio’s 1684 portrait of a be-laurelled Charles II is in close proximity to Iris Palmer’s 2012 portrait of Wing Commander W.L.B. P.C. Farnes, D.F.M. The viewer, one felt, was being deliberately taken off guard, and more importantly, being asked to look at the objects with fresh eyes. 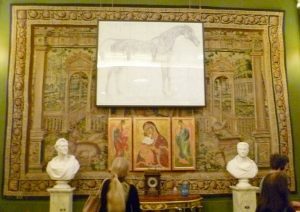 After walking round everything once, I decided that the best way to enjoy the exhibition was to allow the artistic link between the works of art, both ancient and modern, to reveal itself slowly, in its own time. What is instantly recognizable, however, is The Prince’s commitment and enthusiasm for the work the young artists and artisans do. 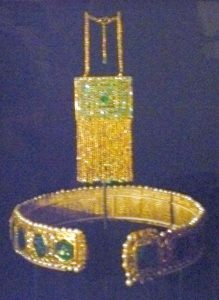 He is obviously passionate about these three charities, and the exhibition demonstrates their high quality workmanship. The Royal Drawing School was set up in 2000 to raise the standard and profile of observational drawing. Drawing, which used to be a key part of every Art College’s curriculum, is no longer seen as an essential part of an artist’s training, and The Prince isn’t the only person concerned by this. The School now has studios across London, a one year postgraduate course, a Public Programme of over 250 daytime and evening classes, a one year full time Foundation course for 18-19 year olds, and much more. Fees are heavily subsidised to ensure that the courses are available to as wide a range of people as possible. The Prince’s Foundation School of Traditional Arts was set up in 2004 to teach students at post-graduate level. It pioneered practical postgraduate degrees in the traditional arts (which include carpet-making, mosaics, and stained glass) across the world, and is particularly concerned that theoretical study integrates with its practical application. In other words, dying arts need to be revived, fully appreciated and actively supported if they are to survive and move forward. The third charity whose works feature in the exhibition is Turquoise Mountain, founded in 2006 to revitalise historic areas, communities and traditional crafts, and to create jobs, skills and a renewed sense of pride. So far, it has trained over 5000 artisans and builders and restored 150 historic buildings in the old city of Kabul in Afghanistan, and their skilled work has now spread to Myanmar and the Middle East. In 2012, Turquoise Mountain won a UNESCO Heritage Award for its restoration and adaptive re-use of historic buildings. 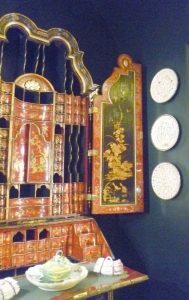 Detail from an Italian bureau cabinet, c.1750-1800 with assorted china, some old, some modern. I thought this was a terrific exhibition; exciting, innovative, and it challenged one’s assumptions. What more could one ask? What a fascinating collection. Envy you that visit. I especially love the idea of everything being higgledy-piggledy in arrangement. Very much up the street of my gypsy soul! Me, too, Elizabeth! I enjoy a touch of anarchy, especially, perhaps, if it turns up unexpectedly, as here, bang in the centre of the Establishment!